I don’t know why anyone would steal that de Kooning painting just to look at it, but different people like very different things I guess. Which is completely fine with me, as long as I don’t have to look at it. Just a random question- did anyone miss it when they took it? I used to be a Scrooge like Caplan, “bah humbug.” But I suspect “My kid could do that” or as I used to say, “I could do that” is a testable hypothesis, and I don’t think it’s true. In the early decades of the twentieth century, the visual, auditory, and verbal arts became an “inside game.” Painters, sculptors, composers (of “serious” music), choreographers, and writers of fiction began to create works not for the enjoyment of audiences but for the sake of exploring “new” forms. Given that the various arts had been perfected by the early 1900s, the only way to explore “new” forms was to regress toward primitive ones — toward a lack of structure, as Bookworm calls it. Aside from its baneful influence on many true artists, the regression toward the primitive has enabled persons of inferior talent (and none) to call themselves “artists.” Thus modernism is banal when it is not ugly. I believe the best art, whether that means movies or paintings or music, is overwhelmingly likely to have been created very recently. If it’s classical music, then in earlier years it was produced by a very small subset of the population, with poorer technology, and under the tutelage of more indifferent teachers. We now search the world for the people with the most innate talent, get them in front of the most skilled people in the world, and do this with orders of magnitudes more people than we did in the past. This argument has certain parallels with arguments for globalization and neoliberalism. I would be shocked if it were not true. There are really two status games going on. One is the “film student” status game which equates what was historically important with what has merit. Most arguments about Mozart or cinema in the 1970s boil down to historical importance in place of one to one comparisons, soberly made after recent history has sorted itself out. The other is the status game that Caplan is talking about. But I don’t think that the answer to the question of which contemporary classical composer is better than Mozart is readily apparent because those with the human capital to competently make judgments about who among us is better than Mozart are socially incentivized to emphasize high status contemporary art or historically important art. Exist Through The Gift Shop is great because it tackles just this question. You seem to falsely assume that just because the reason people like something is as a result of status signaling and other non-essential factors it can’t be that they really experience the feelings of liking it. As numerous experiments have shown with things like cheap wine poured into fancy bottles people really do seem to find things more pleasurable if they believe they are fancy/sophisticated/etc.. The claim being made in the post you are responding to isn’t that this modern art isn’t pleasant to look at. 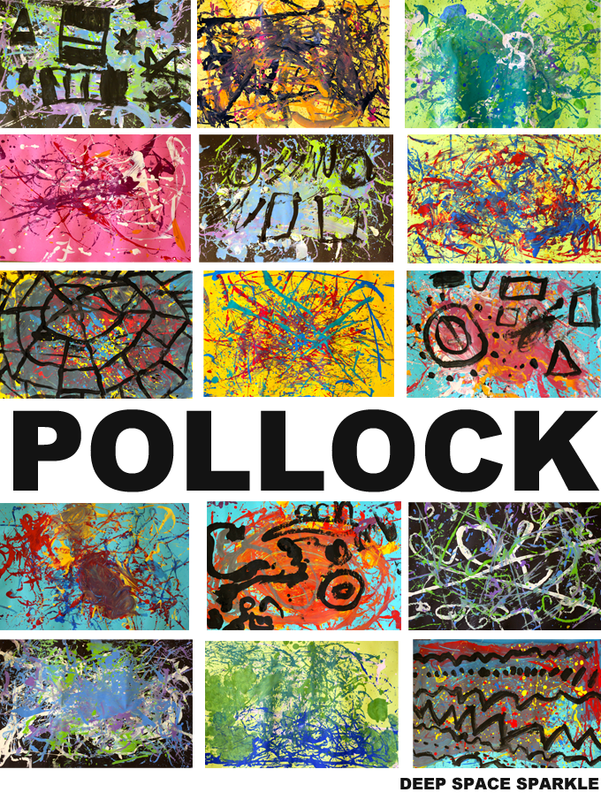 Indeed, I find Pollock’s work quite pleasant and visually pleasing…I just don’t believe it is anymore so than the very similar kind of pictures sometimes made by young kids or other amateurs just playing around splattering paint. So just as people will choose the more expensive bottle of wine to drink while drinking alone even if it has the same contents is predicted by the theory that so too is the fact that people would steal a de Kooning for personal viewing. Indeed, a huge reason why so many people buy into the claims about modern art is because we have a great capability to find beauty and aesthetic richness in anything when we try hard enough (whether you want to say we a recognizing existing aesthetic value or projecting it is a matter of taste). This explains why this phenomena is more common with paintings than with movies though I do believe this theory applies to varying degrees across the spectrum. Indeed, it is your theory which can’t account for the de Kooning theft as if mere aesthetic appreciation were the aim they surely would have been satisfied with a print or a professional replica rather than the original. As for Tyler Cowen. Yes, my impression is that he is exactly the sort of person who would be inclined to like highbrow art. Cowen is enough of a meta-contrarian to enjoy playing the role of the contrarian generally and appreciating the extra gravitas his views have have (and extra status he gets) when they coincide with the socially appropriate view. More generally, you can’t use the fact that it feels like you appreciate certain kinds of art now as evidence against the theory that its the social regard for the art that makes you feel this way. Both the intrinsic worth theory and the people like what they are told is good theory both predict that people grow to like things they didn’t when younger. Its just that one says it is only about the intrinsic features the other says that a huge part of the explanation is your changing relationship to such social signals (teenagers generally perceive far less value in liking sophisticated modern art than older individuals). What is needed to resolve this debate is control exhibits in museums, e.g., give a class of 30 college students a week to produce something they think looks cool choose the best one and hang it along the rest of the art in a museum and see if people notice. I remember quite a few dismissive comments by adults on some modern art, including movies, that I heard as a child or teenager and at the time, accepted as reasonable. And then later, I changed my mind on just these pieces. I started to find them interesting and carefully crafted. So now, I am more careful in judging what I don’t understand. There are quite a few issues rolled into one in the usual modern art critique meme repeated by Bryan. There is the suspicion that the product was made without craftsmanship (Nietzsche had a good quip on that). There is the suspicion that is was made using random processes. The suspicion that enjoyment of it is either fake or the result of some bias. And to be sure, all of these sometimes happen, just as it happens that a really cheap wine can be really good. The irony is that some of the most unintelligible pieces of art (to the layman) are some of the most painstakingly crafted and most well-founded in theory. The music of Boulez, e.g., Le Marteau sans maître, is completely unlistenable to me, but it would be absurd to claim that there was no craftmanship here, that anyone could have done it. Conversely, some of the most ear-pleasing tunes are based on 3-chord, cycle-of-5th standard fare that any child could assemble after a few weeks (days) of strumming a guitar for the first time. Hey, a few lines of computer program could do it completely mechanically (!). I personally resent the philistines that dismiss all and everything out of hand that they don’t understand. It seems to be generally accepted that the Renaissance represented a period of artistic excellence greater than the ages preceding it. It seems unremarkable to suggest that today’s high art is experiencing a crisis caused by the development of technology like photography that has challenged the usefulness of artistic realism. I would not be surprised if, in three hundred years, this period is explored as a relatively poor time for high art. Popular arts, though, thrive. Movie and video game technology lurches ahead and creates spectacular and beautiful worlds that intrigue the masses. I was disappointed by Caplan’s take on modern/abstract art, and I was doubly disappointed that he disallowed comments under that blog post. One of the cool things about Picasso’s portraits is that, for all their surrealism, he adhered to the physical structure of human anatomy. That is, he incorporated the same level of anatomical detail found in, say, a Michaelangelo painting, but he then warped the perspective so that it appeared abstract. Laypeople aren’t going to know this. Even many artists aren’t going to know this. You either have to know something both of painting and of anatomy, or you have to have such a person point it out for you. mbka makes a similar point above about serial music. I happen to love the music of Arnold Schoenberg. You can listen to it with a layman’s ears and declare that it is ugly and sounds “random,” if you want to, but this music was never intended to be consumed this way. Schoenberg developed a thoroughly unique system of music theory and composed music according to an entirely new set of rules, which he invented. So his art consists of two components: (1) the system of compositional rules he developed, and (2) the music created from that system. You can’t appreciate (2) without knowing something of (1). Most people don’t want to take the time to fully appreciate (1), so they roll their eyes at (2). But whose fault is it if the audience doesn’t take the time to understand the full depth of an artist’s work? Caplan says it’s a cognitive bias, which is laughable. With regular exposure to foreign tastes, the human palate becomes more sensitive to foreign intricacies: this is true of both food and art. If Caplan really immersed himself in the world of modern art, I’m utterly certain he’d discover a number of works that he really appreciates. There is enough art out there to satisfy everyone’s tastes. There is something for everyone. Just because you haven’t taken the time to understand someone else’s taste doesn’t mean the artist has failed. If you hate it, you’re not part of his or her intended audience. There’s no harm in that, but let’s not invent silly theories about why the artist was wrong to try to appeal to people other than you. In my younger years, I think I held an opinion very similar to Bryan’s. As I’ve gotten older though, my perception, and appreciation, of contemporary art has changed dramatically. First, I think selection bias plays a large part in maintaining the more dismissive position. We are surrounded by contemporary art pretty much everywhere we go, almost all of it mediocre, at best. Whereas we tend to only remember the more prominent, memorable art from earlier periods. For example, walking through some of the larger European art museums is likely to significantly diminish one’s opinion of the Renaissance era, in my experience. The rose colored glasses have lost almost all of their tint after the X hundredth “Virgin and Child” painting. Second, similar to that last point, I think there’s a sort of diminishing returns to how certain art impacts the viewer. After so many successive viewings, certain styles start to lose their impact. What once was novel and interesting becomes yet another [insert period of choice here] painting. And so the viewer looks for something else that piques their interest. The audience that contemporary art seems to hold the most appeal for is the audience that tends to have been exposed to an enormously disproportionate volume of work than the general public. For such an audience, experiencing works that are new and novel (even in very small, subtle ways, and even if objectively inferior by certain other measures) tend to be far more interesting than experiencing works that they have experienced many, many times over already. Lastly, I think your point number 4 is pretty spot on from the artists’ perspective. This is something that has become even more difficult over the last 20 or so years, and the world becomes even more interconnected. The chances that your audience has already been exposed to or experienced whatever you want to say artistically are exponentially higher than they have ever been. I’m pretty sure that was an oversight. When I’ve seen that, Bryan has always welcomed my going in and changing the settings. So I did so a minute ago. You can now comment on his post. I recommend reading Duncan Watts’ “Everything is obvious”, which is pretty convincing that Bryan Caplan has a point. Thanks, David. I’m much less disappointed knowing that it might have been an oversight, and I happily retract that part of my earlier comment, and apologize for rushing to judgment! Though I think Bryan Caplan is closer to the sociological truth than this post is, I appreciate that as usual, you have taken his arguments on, rather than dismissing them–as would the vast majority of modern or contemporary art fans. Still, the sociological question is a deep, complex one. The Tyler Cowen case provides a good example. I would agree that whatever the explanation of his views are, contrarianism likely plays a big role. I suspect, however, that the reference class to which he is being contrary is not pretentious socialite-types, but smart libertarian types (like Bryan Caplan himself). Caplan-types are whom Cowen really wants to differentiate himself from. No one would mistake Cowen for a shallow socialite. Given the psycho-social complexities of this, it is important to start at the root. Not the question of how could people accept and sustain non-representational art, but the question of where the whole movement came from, intellectually. Because it did not arise in an intellectual vacuum, the sole product of some brilliant aesthetic clairvoyant. My family lived in Germany and Spain when I was growing up, and we saw many of the most famous pieces of art in western Europe at the time. I still can’t even conceive of how a human being could do something like that! When people talk about someone like Jackson Pollock as being an “artist” like Michelangelo was an artist…it’s like saying that the last place Pee Wee League team are ballplayers like a team composed of the greatest professional players of all time at every position are ballplayers. My inclination is that abstract is really a mixture of good and bad, but that not many people are capable of distinguishing “good” from “bad” abstract art. 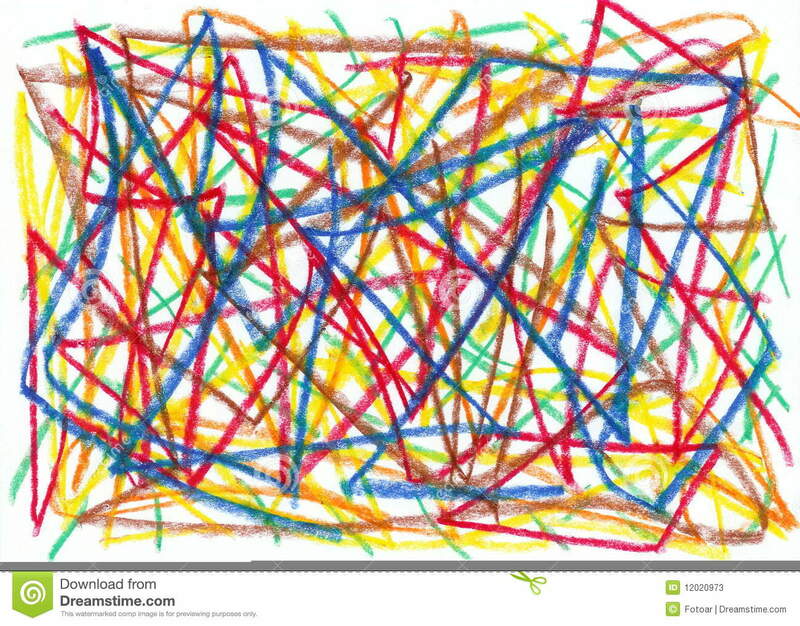 So we end up with a lot of really bad abstract art that the people Caplan describes buy into. It’s probably the same thing for other art forms like music. Most popular music is garbage, some is good, and there are few people who can spot the “good” music immediately. (Sometimes they make mistakes and something that is dismissed as crap gains currency over time). What makes art “good” or “bad” is also highly contextual. The first artist on the scene to do something is usually better because it’s innovative. After that artist gets copied over and over, the same thing becomes derivative and therefore bad. Just as music styles evolve, and music that copies earlier artists just ceases being interesting. In many ways distinguishing good and bad art is a matter of following art movements and recognizing innovation, rather than making objective judgments about individual artworks in isolation. It’s probably the same thing for other art forms like music. Most popular music is garbage, some is good, and there are few people who can spot the “good” music immediately. (Sometimes they make mistakes and something that is dismissed as bad gains currency over time). One of the thorniest issues lies with innovation. A lot of art is interesting only to the extent that it is novel, and then it ossifies. And often, a piece of art becomes important simply because it’s novel in some way, technique or expression or subject etc. – even if it is not very “good” in some other aspects. Once a novelty gets accepted into routine canonical expression, the works based on this innovation become better and more mature. But at the same time they also become more derivative and less interesting – they become more “craft” and less “art”. Hence the fatigue of seeing the 400th baroque virgin with child, or the umpteenth Pollock knockoff. I really wonder to what extent “art” becomes “art” by showing the viewer something in a novel way, and at what point any “art” will fade into “craft” once it is sufficiently understood, practiced, and perfected. I very much liked Ephraim Kishon’s Piccaso’s sweet revenge. Lots of illustrations of both old and contemporary art, it resonates with me a lot. His point is not that all contemporary art is horrible, rather that lots of that art must be some kind of fake and fraud. I saw a small TV interview with a guy who creates metal models of beautiful motorcycles; he said he started doing that to show to the ‘scrap-yard’ artists how to do that. It seems to me that to do great art you need great and preferably novel ideas and great mastery. It often seems to me that in contemporary art the only thing that’s in place is the novelty. In contemporary music in the late 20th century, the worst compliment you could make was ‘see, that has a sound like [insert-famous-composer]’. Everybody was trying to be original and everything ended up sounding pretty much the same – aggressive noise. Caplan: My kid could have typed that! Of course, not every modern artist is Einstein, but then again, neither is every physics paper in arXiv an Einstein either. But the good stuff is really good. For example, Caplan’s critique about art as social agreement was made a hundred years ago by Duchamp’s Fountain. Or maybe not – maybe it was just a urinal. And maybe Einstein just randomly wrote those symbols. But knowing what I know about math and Dadaism, I think both were intentional. Best comment here. I hope other commenters think about what you wrote. Everyone, I’m seeing lots of confusion here. For instance, many people seem to equate “modern” with ugly, but lots of modern art is stunningly beautiful. One comment that I don’t necessarily disagree with is that modern artists are often not as great as “the classics”. In the spirit of Njnnja, how many modern inventors have a track record as good as Edison? How many modern (post-1950) scientists have produced a body of work as impressive as Newton? And yet there are far more scientists alive today. Every year, it gets harder to be great. Just as the early scientists and inventors grabbed the low hanging fruit of ideas and products, the early artists grabbed the low hanging fruit of powerful expressive possibilities. But there are still many great inventors and scientists today, and lots of great artists too. Here’s another point that free market enthusiasts should consider. There are lots of people with conservative taste, even lots of billionaires with conservative taste. So where are the modern Vermeers and Raphaels? Perhaps they are there (in modern art) and you just aren’t seeing them. I DO get some of modern art, so that’s not an argument that will sway me. You need EVIDENCE that I am wrong. Not one commenter (among those who didn’t like modern art) told me what he thought Mozart meant when he said a (difficult) piece was for “the future”. In contrast, I think I know what he meant, because there are films I would have dismissed as trash when I was young, that I now love. That should give one pause. I think music is fundamentally different from art. I hear music, and I’m transported back to time I heard it. For example, last night, the closing song of Ken Burns’ “Vietnam” was “Let it Be,” by the Beatles. I hear that song and it takes me back to a good friend I had in my childhood, who liked that song a lot. I hear the song, and I remember the time, which was a happy time for me. At least with me, art doesn’t transport me back to when I saw it, the way music transports me back to when I heard it. So I think it’s easier for me to be more “objective” about art than about music. see how all of this is subjective. I find the Pollock eminently more complex and interesting than the child’s scribbles, indeed the difference is night and day to me, in esthetics, technique, execution, not to mention historical context and development. 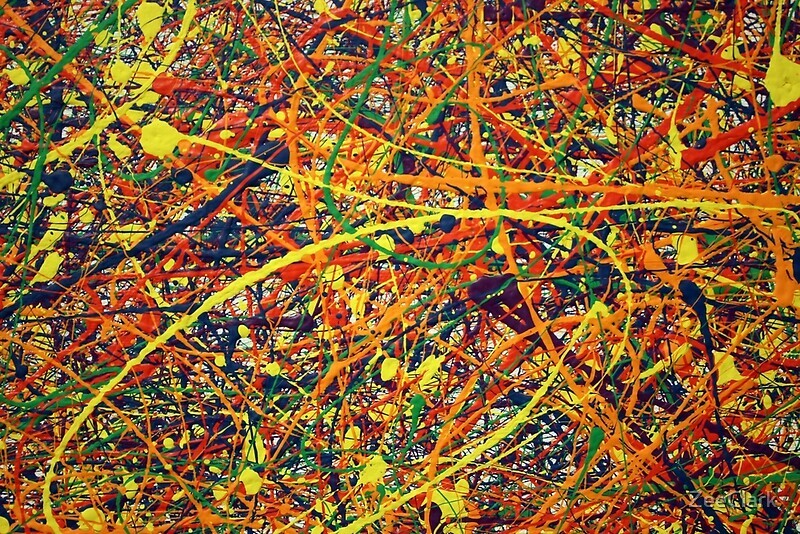 I’d have the Pollock you link to in my living room, quite willingly. At the same time I have seen so many baroque paintings and sculptures in the churches of my childhood that I just can’t watch any more of them. It doesn’t matter to me how well they’re executed, they all seem stale to me now.